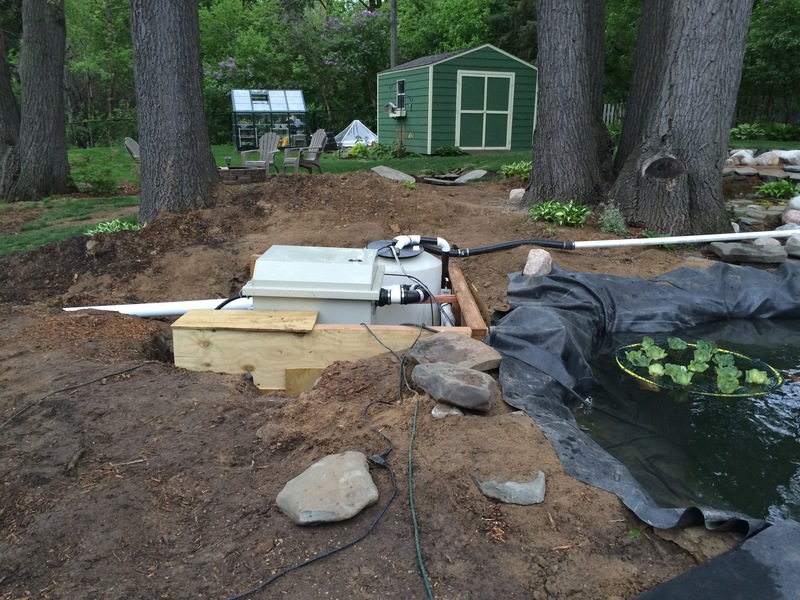 Visit the section regularly to see what the pond digger is up to this year. He seems to have endless enthusiasm for trying something new and upgrading. It always seems to involve moving rocks and a lot of digging. 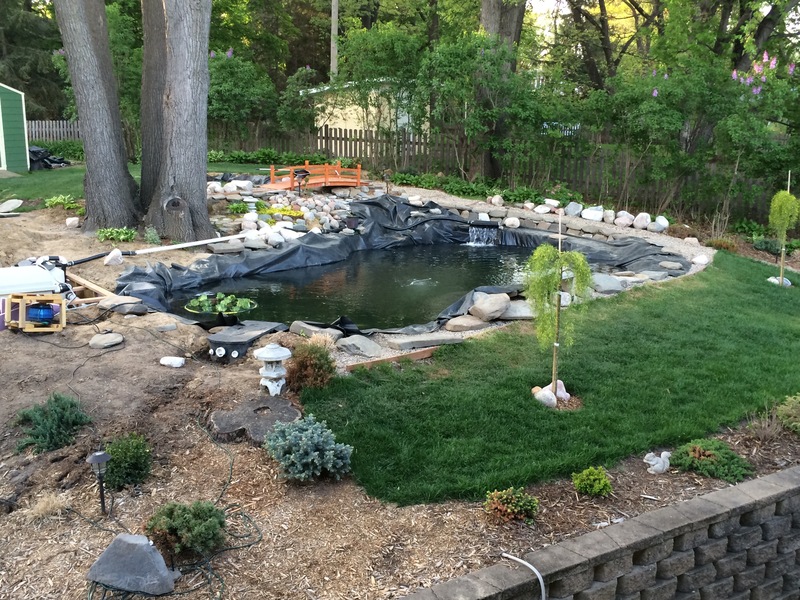 Some people have Harleys (motorcycles), we have our ponds…. Explaining the system of tangential pond returns, bottom drains and the toilet bowl effect. 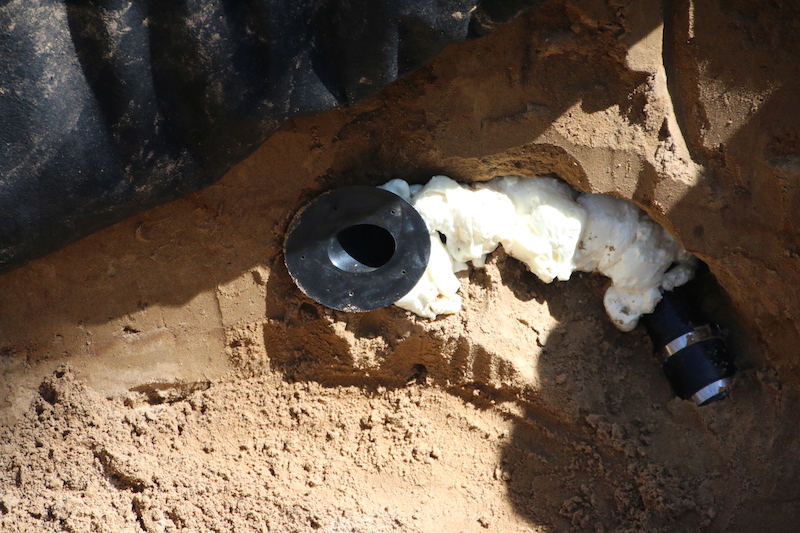 The TPR (tangential pond return)… he installed four of these and a mid water return in the upper pond. The RDF – rotary drum filter ordered from BridgeWay Koi. ” ProfiDrum is a company that is focused on the development and production of innovative products in the field of water purification. 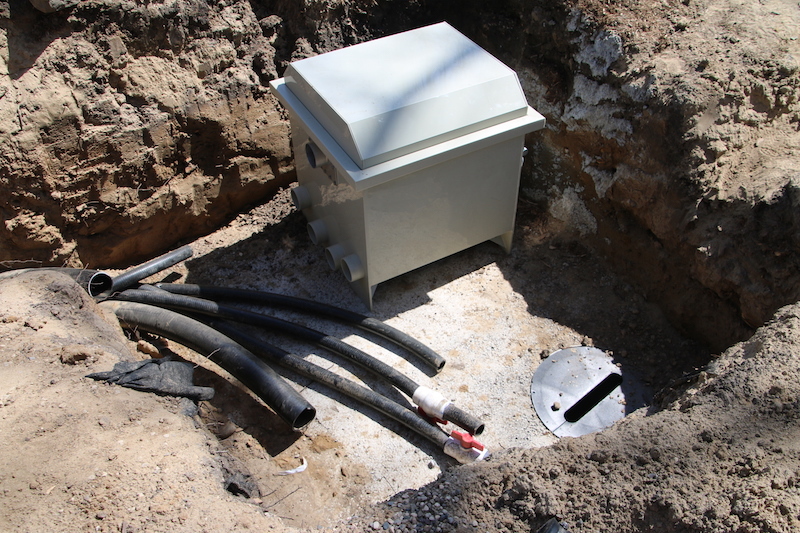 Our systems are designed for water companies, fish farms and pond hobbyists that have high requirements for water quality. The concept of our filters ensures superb quality and sublime disposal of solids and dirt particles by means of techniques that originate from water treatment. I am unable to park in my garage bay. We actually return a lot of stuff to the store at random intervals. 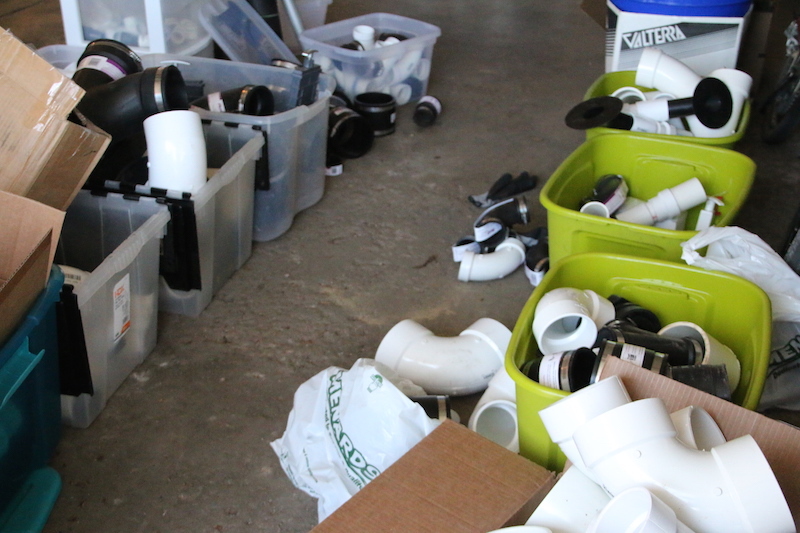 I’m surprised Home Depot lets my husband in the door when he drags back his Santa pack full of PVC parts to return. Working on a pond in Minnesota can be a little cold even if it is 50 or 60 degrees and sunny. 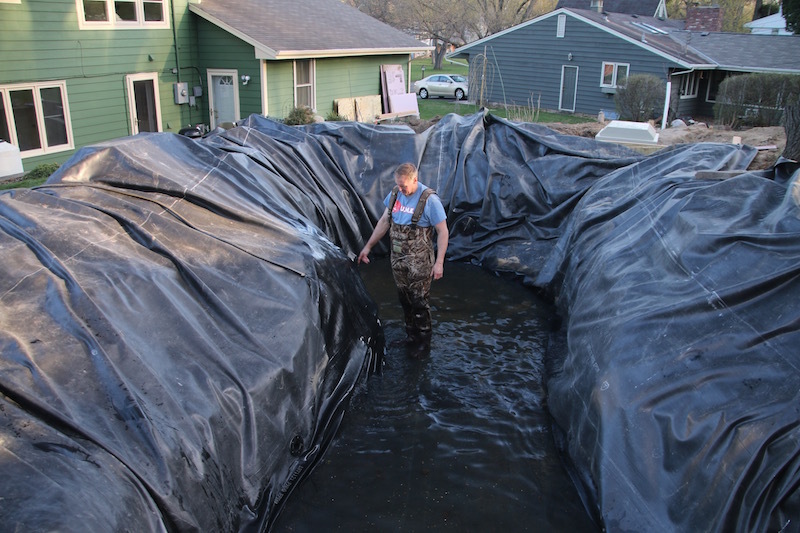 Some chest high waders allows the pond digger to comfortably remain and work in the water. Finished putting in the returns in the pond and started filling the pond. 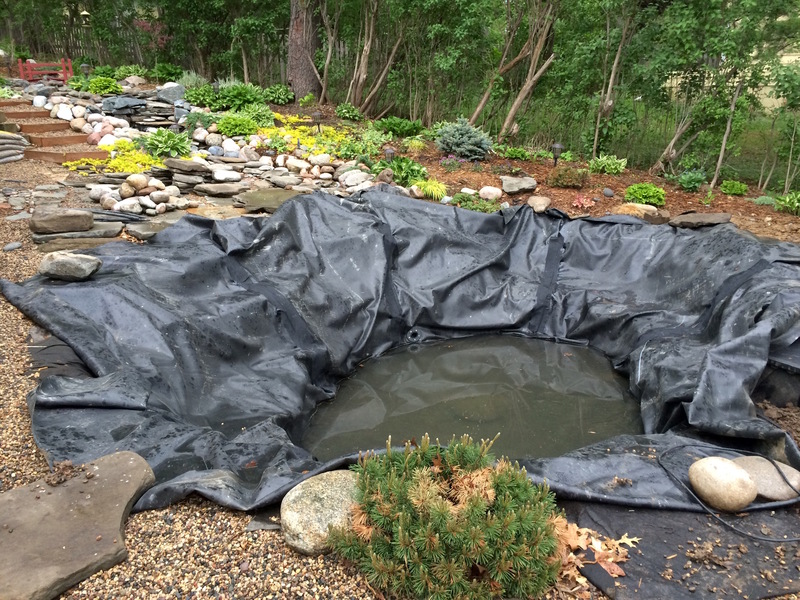 The pond digger will be working on minimizing the wrinkles by folding and pulling as the pond fills. The lower pond is still waiting for some attention. 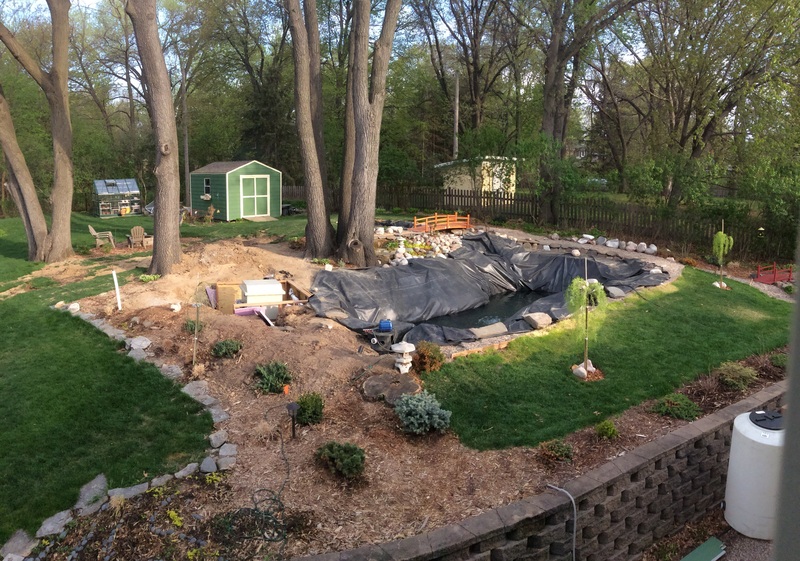 We were thinking about dismantling and redoing the rocks for the waterfall but I’m ready to get this pond started. 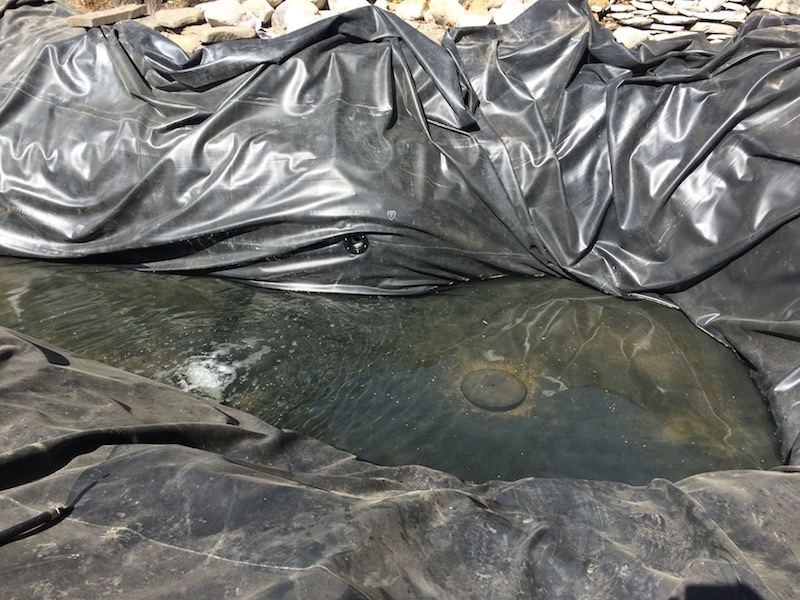 We need to put in some returns and the pond digger has not yet decided what type of filtration system he is going to use. The wall between the filter area and the pond looked like it needed some reinforcement to keep from collapsing. The dirt in this area tends to be sandy. A combination of concrete blocks, concrete, dirt and insulation should ensure a sturdy wall. 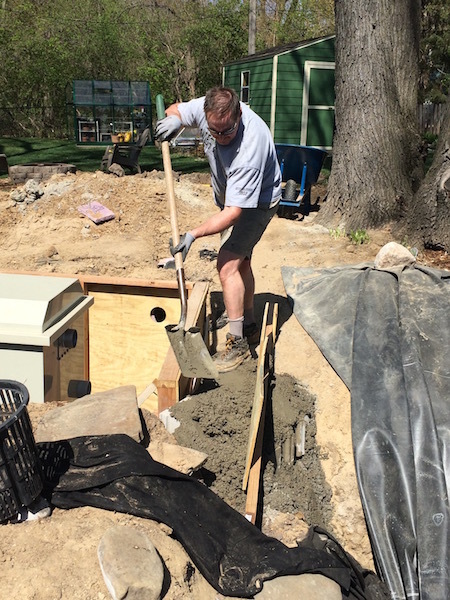 We will most like use concrete to permanently set in a lot of walking stones around the pond this year. 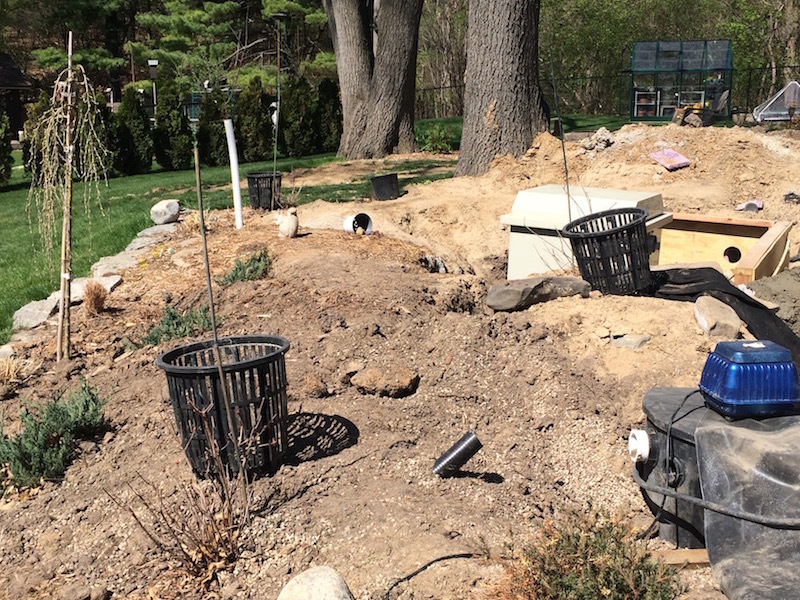 The landscaping in this area will have to wait until the filter box is done. However, my azaleas were in danger of being trampled and some of the little plants are under a lot of dirt. I’ll be heading out to the nursery this weekend to look for some new plants. We still have to think of an attractive cover for the filter equipment area. A raised deck might be nice…. 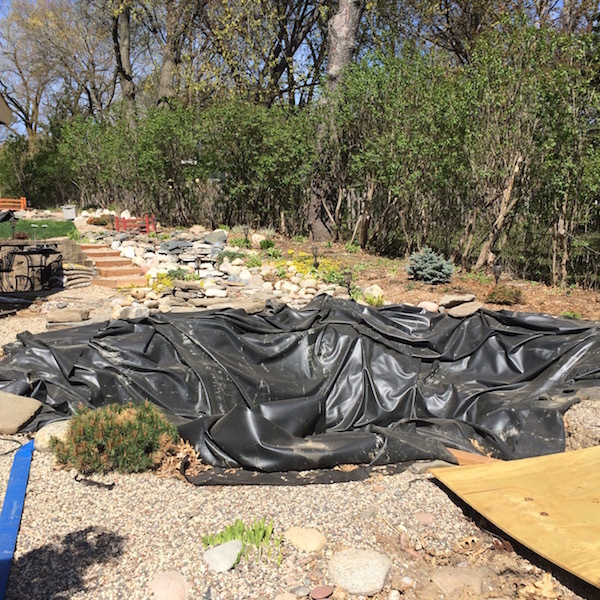 May 3, 2015 a lot of progress made yesterday on the upper pond. 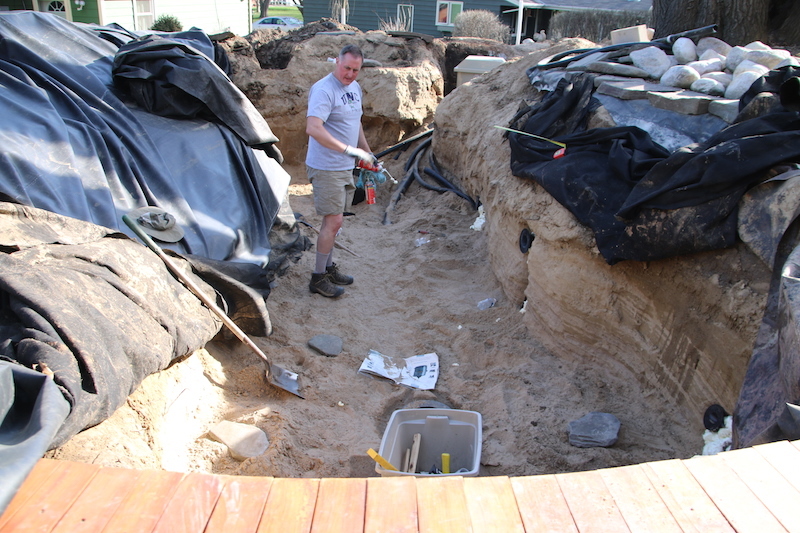 The liner folds were taped down and the pond digger started filling. We trimmed some of excess liner and cleaned up some of the landscaping. I purchased two more Walker Weeping Caraganas – miniature weeping willow type of tree, also known as peashrub). I would love to go get some more azaleas but we’ll have to see how the equipment area gets topped off first. The pond digger has said that the koi can be put into the pond later today. We’ll probably throw in ChaCha for the test run. Sometimes the pond work is two steps forward and then one step back. We’re getting closer to thinking about landscaping but those thoughts are still a few weeks away. The upper pond is now functional. We’re thinking about using some diffusers for the upper pond and the bog filter is going to be bypassed with a second moving bed filter (I think this is the plan currently…) As for the lower pond, the pond digger has been thinking about different plans. Today the plan is to continue to use the bog filter, some sort of settling tank, a bead filter, yadda yadda yadda. I’ve learned to never really count on what’s going in until stuff actually starts getting built. 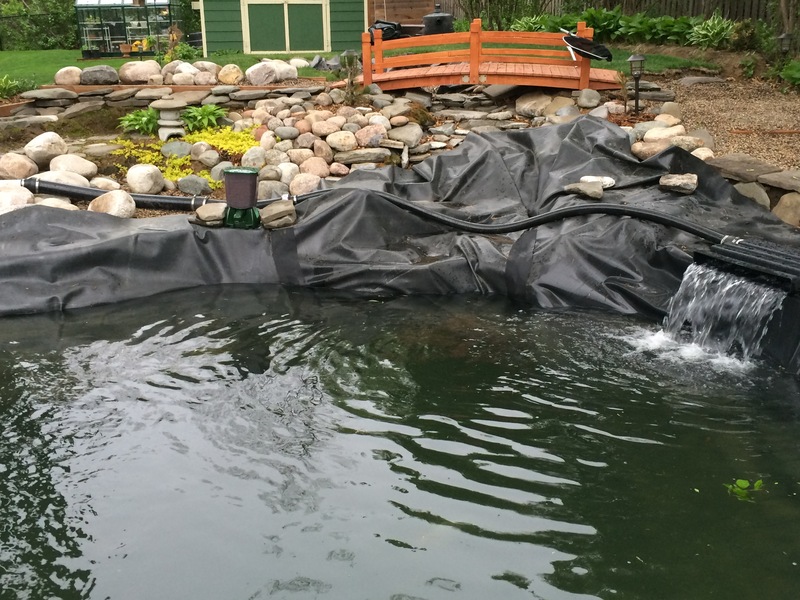 The lower pond has two tangential pond returns, taped down folds and is ready to fill once the filtration system is hooked up. Last year the water came crashing into the pond over the waterfall. This year we’re going to try to create a calmer scenario with the use of diffusers. We also have an automatic koi feeder going but I think it’s dropping out too much food.